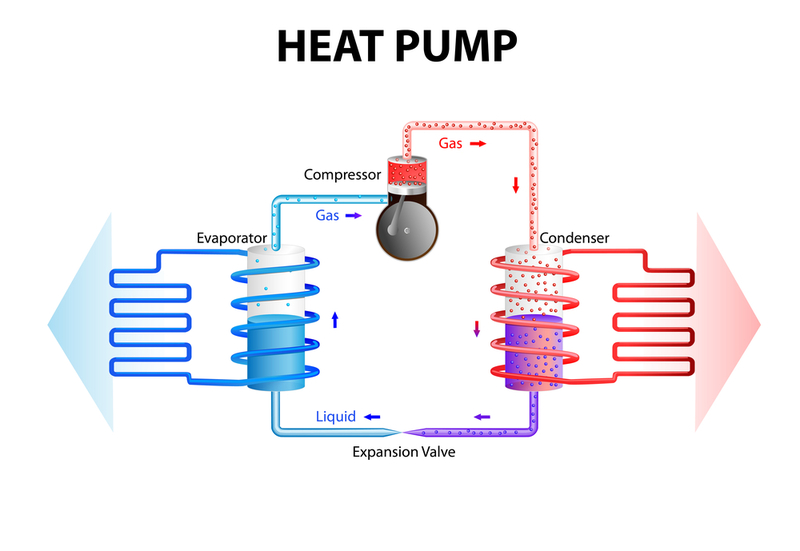 Ground source heat pumps, also called geothermal heat pumps, harness the cool, even temperature underground to draw heat outside. Using buried coils, ground source heat pumps constantly move heat based on the direction the valves are set. During the winter, the system collects heat that radiates into the ground from sunlight and moves it indoors, warming your indoor space. Ductless mini-split heat pumps contain two components—an outdoor compressor and an indoor unit that is mounted to the wall. Like geothermal heat pumps, ductless mini-split heat pumps can either be set to move heat from inside to outdoors or to collect heat outside and transfer it into your home. However, one of the biggest advantages of ductless mini-split heat pumps is their size and the ease of installation. Since the systems don’t require complex vent work, owners can easily install them in rooms that need additional heating and cooling. Although heat pumps do a great job at heating and cooling homes, people who live in especially hot or cold parts of the country might find that their system can’t keep up with the temperatures. Hybrid heat pumps are designed with additional integrated boilers or air conditioning units, making it easier to achieve even temperatures year round. Are you in the market for a heat pump? Talk with the team of HVAC experts at Guelzow Heating & Air Conditioning Service in Wisconsin Rapids, WI. In addition to offering a wide variety of heaters and air conditioners, they can also help with in-floor heating, duct cleaning, fireplace tune-ups, and 24/7 emergency service. For more information about their services, send them a message online or call (715) 423-1086.